After a solid run through the rumor mill, Nick Saban will stay put in Tuscaloosa for a little longer. Breathe easy, Tuscaloosa. Nick Saban is staying put a while longer. The Alabama head coach will remain just that, the school confirmed Friday night, announcing via Twitter that Saban and the Tide "have concluded a long-term agreement to keep him as head coach" amid heavy rumors that he was considering bolting for Texas. Alabama didn’t release terms of the deal, which must be approved by the board of trustees. 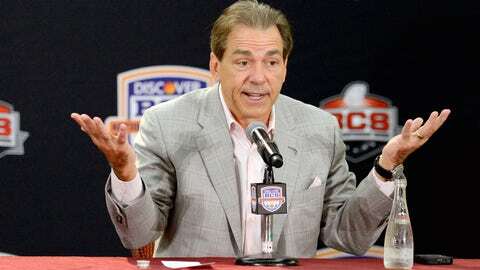 One report said the deal would give Saban a raise to over $7 million annually. ESPN’s Kirk Herbstreit first broke the news on Twitter earlier Friday. 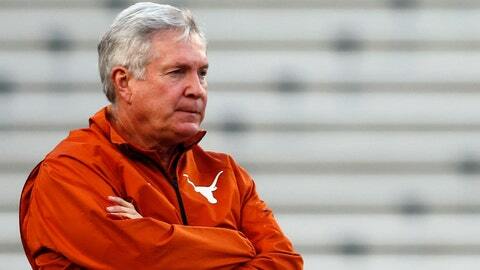 That news came down while current Texas head coach Mack Brown was giving a speech at the Longhorns’ football banquet. Brown was rumored to be addressing his future during the speech, and there were plenty of rumblings that Saban was in line to take the job. Brown, though, did not address his future, and shortly after his speech, conflicting reports expressed uncertainty over the fate of the 16-year Texas head coach. One report via Twitter suggested that Brown would remain the Longhorns coach. Another via ESPN suggested Brown was "fighting for his job." Saban, who turned 62 on Oct. 31, has led the Crimson Tide to three national titles in the last four years. He received an eight-year deal in March 2012 worth about $5.6 million annually, which already made him the highest-paid coach in college football. Nick Saban got his extension Friday. As for Mack Brown? We still don't know. Get the latest on the situation in Austin. The third-ranked Tide was on the verge of another Southeastern Conference and perhaps national title this season before losing 34-28 to No. 2 Auburn in the regular-season finale on a last-play, 109-yard return of a missed field goal. Alabama will play Oklahoma in the Sugar Bowl on Jan. 2 in New Orleans. Saban repeatedly denied interest in the Texas job, saying he was "too damn old" to go start over in a new place. "I’m very committed to the University of Alabama, love being here," he said in November. "We’ve talked about it before. Don’t need to talk about it again." All that likely did little to set Tide fans’ minds at ease, though, as he also infamously declared he wouldn’t be the Alabama head coach shortly before bolting the NFL’s Miami Dolphins for that very gig. Despite the persistent rumors, Alabama quarterback AJ McCarron said Thursday he was confident Saban would remain. We are excited about the future and the University of Alabama is where I plan to end my coaching career. A head coach since 1995 in both college and the pros, Saban has won four national championships in all, also nabbing one during his stint at LSU from 2000 to 2004. He left Baton Rouge for the Dolphins after that, spent two seasons in Miami, and has been in Tuscaloosa since 2007. Saban is 74-14 in seven seasons at Alabama, with at least 11 wins in five of the last six years and a string of top-rated recruiting classes. The Tide was trying to become the first team to win three straight national titles since the 1930s. Video: Was Saban’s extension about legacy?